Government is not made in virtue of natural rights [Burke wrote], which may and do exist in total independence of it, and exist in much greater clearness and in a much greater degree of abstract perfection; but their abstract perfection is their practical defect…. Government is a contrivance of human wisdom to provide for human wants [such as protection against force and fraud]. Men have a right that these wants should be provided for by this wisdom. Among these wants is to be reckoned the want, out of civil society, of a sufficient restraint upon their passions. Society requires not only that the passions of individuals should be subjected, but that even in the mass and body, as well as in the individuals, the inclinations of men should frequently be thwarted, their will controlled, and their passions brought into subjection. This can only be done by a power out of themselves, and not, in the exercise of its function, subject to that will and to those passions which it is its office to bridle and subdue. In this sense the restraints on men, as well as their liberties, are to be reckoned among their rights. But as the liberties and the restrictions vary with times and circumstances and admit to infinite modifications, they cannot be settled upon any abstract rule; and nothing is so foolish as to discuss them upon that principle. Here we have a passage that most Objectivists are incapable of understanding. The typical Objectivist will read the passage “Government is a contrivance … to provide for human wants” as a license to provide for any and all wants; but this is not at all what Burke means, as anyone familiar with writings will understand at an instant. Burke is merely reiterating the view, common among the English in the 18th century, that the purpose of the government is to serve the citizens of the community, rather than the citizens serving the government. Burke is here asserting a different view of human nature, one that clashes with Rand’s view that man is a “rational animal.” For Burke, human civilization is a delicate contrivance that, if mismanaged, can easily dissolve into anarchy. This is why Burke favors cautious reform . In politics, it is so easy to make things worse, yet very difficult to make things better. But the most important statement in the passage is where Burke writes “ as the liberties and the restrictions vary with times and circumstances and admit to infinite modifications, they cannot be settled upon any abstract rule.” This statement constitutes one of the essential differences between Burke and Rand. Rand believes (at least implicitly) that political and social reality is simple enough to be adequately represented in abstract principles derived from “reason” (i.e., conscious deliberate reasonings guided by “logic”). Burke, as an experienced statesmen, knows that Rand’s view of political and social reality is false: the reality confronting the statesman is simply far too complex to be summed up in a few abstract rules. The science of constructing a commonwealth, or renovating it, or reforming it, is, like every other experimental science, not to be taught a priori. Nor is it a short experience that can instruct us in that practical science, because the real effects of moral causes are not always immediate; but that which in the first instance is prejudicial may be excellent in its remoter operation, and its excellence may arise even from the ill effects it produces in the beginning. The reverse also happens: and very plausible schemes, with very pleasing commencements, have often shameful and lamentable conclusions. In states there are often some obscure and almost latent causes, things which appear at first view of little moment, on which a very great part of its prosperity or adversity may most essentially depend. The science of government being therefore so practical in itself and intended for such practical purposes — a matter which requires experience, and even more experience than any person can gain in his whole life, however sagacious and observing he may be — it is with infinite caution that any man ought to venture upon pulling down an edifice which has answered in any tolerable degree for ages the common purposes of society, or on building it up again without having models and patterns of approved utility before his eyes. These metaphysic rights entering into common life, like rays of light which pierce into a dense medium, are by the laws of nature refracted from their straight line. Indeed, in the gross and complicated mass of human passions and concerns the primitive rights of men undergo such a variety of refractions and reflections that it becomes absurd to talk of them as if they continued in the simplicity of their original direction. The nature of man is intricate; the objects of society are of the greatest possible complexity; and, therefore, no simple disposition or direction of power can be suitable either to man's nature or to the quality of his affairs. When I hear the simplicity of contrivance aimed at and boasted of in any new political constitutions, I am at no loss to decide that the artificers are grossly ignorant of their trade or totally negligent of their duty. The simple governments are fundamentally defective, to say no worse of them. If you were to contemplate society in but one point of view, all these simple modes of polity are infinitely captivating. In effect each would answer its single end much more perfectly than the more complex is able to attain all its complex purposes. But it is better that the whole should be imperfectly and anomalously answered than that, while some parts are provided for with great exactness, others might be totally neglected or perhaps materially injured by the over-care of a favorite member. The pretended rights of these theorists are all extremes; and in proportion as they are metaphysically true, they are morally and politically false. The rights of men are in a sort of middle, incapable of definition, but not impossible to be discerned. The rights of men in governments are their advantages; and these are often in balances between differences of good, in compromises sometimes between good and evil, and sometimes between evil and evil. Political reason is a computing principle: adding, subtracting, multiplying, and dividing, morally and not metaphysically or mathematically, true moral denominations. Burke would regard Rand’s politics as merely “metaphysical” (by which he would mean: founded, not on experience, but on rationalistic speculation). Rand’s notion of establishing the state on her very simple concept of individual rights—a concept, moreover, which can never be compromised upon, regardless of the consequences—Burke would find as “fundamentally defective.” And Rand’s implicit confidence in her own reasoning powers, which allowed her to arrive at principles concerning matters that she knew little if anything about, Burke would view with dismay. In contradistinction to the speculative rationalism of Rand’s politics, Burke would assert his most element insight—namely, that the science of government requires extensive (and intensive) experience, “even more experience than any person can gain in his whole life, however sagacious and observing he may be.” This is the key insight that most differentiates the political thinking of Burke, Hayek, Oakeshott, Sowell, Michael Polanyi, and other sophisticated conservatives from Rand and her disciples. Individual Rights 4: Paper Rights. “Politics,” Otto Von Bismarck tells us, “is the art of the possible.” Since most people who frame theories of politics have no political power and therefore no effective political will, their political speculations remain unchecked by reality. They are merely idle fancies that exist only on paper. The individual rights advocated by Rand are precisely of the paper variety. They never can nor never will be instituted in reality, because there are too many rooted sentiments and vested interests that stand against them. In a “free” country where people are allowed to develop their own political opinions without fear persecution from the state, wide divergences of political ideology inevitably arise. A democratic nation is an unworkable committee, governed by competing elites of divergent views. The only way to get anything done is through compromise. Hence, no ideological faction can ever expect to get carte blanche: even when they control the legislature and the executive they still won't get everything they want, because the “loyal” opposition can use consititutional protections and the power of vested interests to create a myriad obstacles to any measures involving sweeping change. What, if anything, can be accomplished towards increasing the “rights” of the individual in the sense of limiting the power of the state to regulate and tax its citizens? There is very little that the average individual can do, since he constitutes, politically speaking, merely one vote among tens of millions. As part of a much larger organization (of, say, a major political party), he may have some effect, particularly if that organization is well led (leadership is absolutely indispensable to get anything done politically). But here’s precisely the rub. An organization, to wield any sort of political influence, must be large. Yet this requires having a “big tent,” i.e., accepting as many people as possible. There is, however, a perplexing trade-off involved in developing a political party that can wield influence and exert a political will: the greater the party, the more compromises that have to be made on ideological grounds to keep it together. The more people you try to appeal to, the more you have to dilute and widen your ideology. But the more you dilute and widen your ideology, the greater chance of your party falling into faction and breaking apart. So there is always a tension between the size of an organization and its cohesiveness. If an organization is ideologically pure, it’s too small to exert a credible influence. If it is too large, it tends to break apart. A political party capable of taking power must find that elusive compromise position between ideological purity and size. Orthodox Objectivism is one of the most purest ideologies on the current scene. Yet this very purity condemns Objectivism to obscurity and political impotence. The current Objectivist leader, Leonard Peikoff, has rigorously distanced himself from all potential political allies. Indeed, he seems to despise the potential allies far more than he does his ideological enemies. 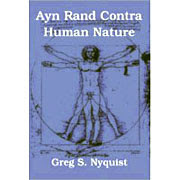 David Kelley’s brand of Objectivism is, politically, nearly identical to Peikoff’s version: yet Peikoff has told Kelley’s followers to get lost (“if you agree with the Branden or Kelley viewpoint or anything resembling it—please drop out of our movement: drop Ayn Rand, leave Objectivism alone,” he wrote). Libertarians, Peikoff insisted on his radio show in nineties, “are worse than communists.” And as for the Republican Party—an organization which, despite its many faults, constitutes the most effective political force aligned against Obamacare—deserves to be either “destroyed” or “severely punished” for the enormous crime of allying itself with evangelical Christians. So those Objectivists who follow Peikoff remain, for the most part, excluded from the political process. Because of this ideological purity, Objectivists have no effective political will and therefore no sense of responsibility. They can advocate any measure, make any claim, without ever worrying about empirical refutation. Empirical testing, when possible, is always the best way to check the truth of any idea, political or otherwise. When such testing is not possible, the human fancy can reach any conclusion it pleases, without fear of contradiction or embarrassment. This is one reason why fringe political groups with no power often believe the strangest things: they never have to worry about reality refuting their whacky ideas, because those ideas will never be tested. There is, however, one other crucial side to this. Strangely enough, however irrational an individual’s speculative beliefs may be, normally, they tend to be at least “reality-orientated” when it comes to the business of life. There are Christian fundamentalists, for example, who claim to believe in some rather odd theological speculations that overstep important realities by a wide margin. Yet these odd beliefs do not interfere in their business activities, which often display a high degree of shrewdness and even rationality. The eccentric philosophy professor—to take another instance—who claims that reality doesn’t exist or that knowledge is impossible, nonetheless, when away from the university lecture hall, completely ignores these absurd claims when he’s paying bills, pursuing hobbies, and running his personal household. The beliefs of theologians and academic philosophers are often mere “paper” beliefs. They are either not meant to be followed or impossible to follow. One interesting characteristic of paper beliefs is that, on one of those rare occasions when an advocate of these beliefs gets a chance to put them in practice, they often “betray” those beliefs. Being placed in a position of responsibility, where one must bear the full burden of failure, often sobers people up. Which leads to the question: would Objectivists be sobered up if they were suddenly thrust into a position of responsibility? Would they really nuke Iran if they had the power to do so? If it became clear that their laissez-faire, no-welfare policies would lead to the death by starvation of 10,000 people, would they really stick to their guns and allow the deaths to occur, even though it would discredit them in the eyes of many and turn people against their ideology? What sort of paper is their beliefs really made from? One chooses dialectic [i.e., logic, “reason”] only when one has no other means. One knows that one arouses mistrust with it, that it is not very persuasive. Nothing is easier to erase than a dialectical effect: the experience of every meeting at which there are speeches proves this. It can only be self-defense for those who no longer have other weapons. One must have to enforce one’s right: until one reaches that point, one makes no use of [dialectic]. Now it’s important not to take this passage out of context. Nietzsche is not attacking logic, but merely the misuse of logic. Logic is a tool of knowledge; it is not a psychological or political force. Anyone who is reduced to arguing for their rights demonstrates merely that they lack the ability to enforce their rights. And rights without force are completely useless. The other idiosyncrasy of philosophers is no less dangerous; it consists of confusing the last and the first. They place that which comes at the end—unfortunately, for it ought not to come at all—namely, the “highest concepts,” which means the most general, the emptiest concepts, the last smoke of evaporating reality, in the beginning, as the beginning. The “last smoke of evaporating reality” indeed! When you build arguments out of such broad abstractions, you end up missing important details. This is precisely what happens when Objectivists argue about rights. One Objectivist, recently quoted in the comments section of my last post, insisted that a denial of individual rights “usually leads to suffering, and yes, often to death, alas.” Now this statement is clearly an exaggeration. A complete denial of rights (e.g. complete and abject slavery) may lead to an increased mortality rate, but that is little different than saying it leads “often” to death. But even if the statement were true, it still does not make for a convincing argument, because it fails to distinguish between those who are enslaved and die and those who gain by the slavery and live. The question is: how does one convince those who gain by the slavery that what they are doing is immoral? What persuasive reasons can there be? That the enslavers would be “better off” if they didn’t enslave people? Well, unfortunately, that’s not necessarily the case. History is replete with examples of individuals who benefited from slavery over a long life. A rather horrible version of slavery existed under the Roman Republic and later under the Roman Empire; yet Rome, in both its republic and imperial incarnations, lasted for centuries; and many a Roman slave holder lived to a ripe old age. If one were to argue that political orders based on slavery eventually disintegrate into anarchy and bloodshed, well, that is true of all political orders, whether based on slavery or not. If, taking a different tack, one argues that society as a whole, including the slave-holders, will be “better off,” economically, without slavery, again this argument is too abstract to be convincing. In the first place, there is no guarantee that each particular slave-holder will in fact be economically “better off.” If you are slave-holder and living high off the hog, wouldn’t it be safer to keep things as they are? But even more to the point, what if the slave holder is not interested in being “better off” economically? What if he likes nothing more than to boss people around? There are people like that. Such people can’t be changed through logic and arguments. What does Objectivism propose to do about these people, when they dominate within the ruling elite (as they often do)? Go on strike? Good luck with that. The power hungry individual, the man who gets his jollies from forcing other people to obey and respect him, constitutes one of the great obstacles to creating a stable, long-lasting free society. Objectivism tries to minimize the threat of this individual by caricaturizing him as weak or dependent, like the villains of Atlas Shrugged. Objectivists accuse such people of living like animals. Such men are “evil”; their way of life, Objectivism implies, leads to death. But again, Objectivists are arguing on the basis of abstractions that are too broad, and hence miss important details. Let us assume for argument’s sake that the power hungry individual who wishes to dominate other people will likely not live as long as individuals who respect the rights of others and who have no interest in power. If this assumption is true, would this justify Rand’s contentions that dictators are evil? Not necessarily. Consider the following moral test. Suppose an individual has two choices: (1) he can live until he is 80 as an unimportant individual under a free and prosperous social order; or (2) he can live until he is 40 as a dictator enjoying nearly anything he wants, including wealth, women, power, etc. Now it’s mere sophistry to suggest that anyone who chooses (2) is choosing death. They are not choosing death at all: they are choosing a shorter life that enables them to achieve their values. For hardly anyone regards life as an ultimate value, but merely as a means of achieving what they in fact value. Rand’s attempt to base morality on life is a mere rationalization. For better or worse, there are people out there who would gladly sacrifice forty years of their lives in order to live high off the hog, bossing people around and having access to the most attractive women. To say that such people are choosing “death,” or “living like animals” is merely to engage in impotent name calling. The Stalins, the Hitlers, and the hordes of other dictators and rights violaters are not going to vanish because Rand and her followers call them names. So ponders the Wall Street Journal.